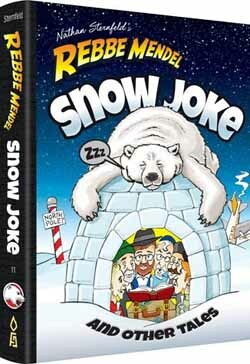 Well, stop in your tracks and bundle up with Rebbe Mendel's warmth and humor! Filled with exciting stories, riddles, yotzei dofen, Figure-It-Outs and Torah lessons galore, this latest edition in the series keeps you on the trail to fun and values. Brrreak the ice with Ulai ben Sender, Igor Kazimirski, Moshav Afarsek, Sternfeld from the housewares, thirty different-colored marbles in a hat, the seven liquids… and "snow" much more. You better bear-lieve it - it's paw-sitivley grrreat!